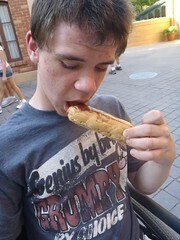 The France Pavilion is among Mik's favorite places in Epcot. This is because of the chocolate eclairs at the Boulangerie Patisserie. He remembered getting one back in 2007 and was one of the main things he looked forward to getting on this trip. He was not disappointed by the actual eclair, but he does not like the bakery building set up. Mik ended up waiting outside while I waited in the line to go in and get him an eclair. There is a ramp up to the door, but the line was on the stairs and it ended up being a good choice to just leave Mik outside because the exit does not have a ramp. You can get back down the ramp by the entrance, but that would have required asking several people to move out of the way in the cafe style seating area between the exit and the entrance. 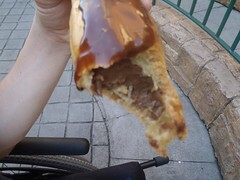 Plus, it is quite crammed inside the bakery with two lines forming down the middle, but Mik thinks the eclair is totally worth it as long as someone else goes in and gets it for him.